A belated Happy New Year – I hope 2019 has started well for you! This post shares some exciting news, along with my plans for the coming year. It also alerts those of you who have How To Self-publish and Market a Children’s Book about a couple of minor updates that you can grab online. Firstly, I’m thrilled to say that I’ve just signed a foreign rights paperback deal with Botart publishing house in Albania for The Secret Lake 🙂 I’d never heard of them (no surprise there) but it turns out they publish David Walliams, Jaqueline Wilson and Dr Seuss amongst others, so I think I shall be in pretty safe company! They’ll be doing a print run of 1,000 for which they’ve paid me an advance. I’ll then earn a royalty once/if the advance is earned out. It’s not a huge deal as it’s a small market, but it’s been a fantastic learning curve; just the right size project to cut my teeth on. And because the deal is direct, there are no agents fees taking a slice along the way. I had invaluable help from The Alliance of Independent Authors in negotiating the royalty and other terms — all part of the service if you’re a member. Having my lawyer son to check things over was pretty useful too. Needless to say, I can’t wait to hold of a copy in Albanian – and I shall be intrigued to see what they do with the cover. Initial estimates for the publication date are June 2019, however that may change. I’ll keep you posted. So how do you get a foreign rights deal? Of course, traditionally published authors have agents to handle this for them – or their home country publisher may also handle their foreign rights. However, the few enquiries I’ve made have drawn a blank as far as getting an agent just for foreign rights goes. This deal came about following an unsolicited email enquiry from Botart’s Editor-in-Chief, requesting a reading copy. It’s not the first time I’ve been approached this way. A few years ago Random House in Germany and a major Turkish publisher requested reading copies of Eeek!, though neither came to anything. More recently, I’ve had approaches for The Secret Lake from Greece, Turkey, Iceland and (just last Friday) a major Russian children’s publisher. Whether any of these will come to anything remains to be seen, but at least I now feel prepared. Following on from this – and on the back of my sales – this year I shall be researching ways to make contact with children’s rights buyers at London Book Fair. The Secret Lake continues to rank very highly on Amazon UK (around 500-700 as I write) – and has crept up the charts in the US. With print sales now standing at well over 20,000, and one deal signed, I’m hoping I may be able to get some more attention there. Whatever I learn I shall, in due course, report back. For those of you who have ‘How to Self-publish and Market a Children’s Book’ I’ve just posted an interim minor update document in the shared Dropbox folder. A couple of alerts/reminders about a few changes in the industry, such as Google+ closing down in April and Instafreebie rebranding to Prolfic Works. I must say that I had assumed How to Self-publish and Market a Children’s Book might sell two or three copies a week if I was lucky, but it’s averaging more like one a day, which is a very nice surprise. It’s also received some wonderful 5-star reviews – a big relief after all the hard work! On that note, if you’ve bought a copy, it would mean a lot to me if you could find a moment to leave a short review on Amazon and/or Goodreads, or your store of choice. Record an Audiobook of The Secret Lake – narrating myself but with professional editing/production. This is long overdue! Publish a new picture book in time for Christmas. The title was chosen years ago and the text is complete as of last week. The story has been going around in my head for the last five or six years and has been in various stages of draft for the last 18 months. Finally it has come together and I’m now about to brief the illustrator. She works on paper and has an entirely different style to my Bosnian Illustrator – I can’t wait to see what she comes up with! Try to sell more foreign rights for The Secret Lake – and possibly Eeek! – whether directly or by finding an agent who can handle this for me. It’s World Book Day in the UK on March 7th and I shall be at four schools that week. I’ve already enjoyed school visits in October, November and January of this academic year, where the Reception year children have loved a new video I have of a hedgehog running up the road beside my family home. Spreading school visits out each month certainly works very well and it’s something I want to try to make a habit of rather than packing everything into February and March, which has happened in previous years! Don’t forget, I have a whole section dedicated to setting up and running successful school visits in How to Self-publish and Market a Children’s Book, including download order form samples. It’s a lot of work putting these visits in place, but it’s more than worth it once you get there! 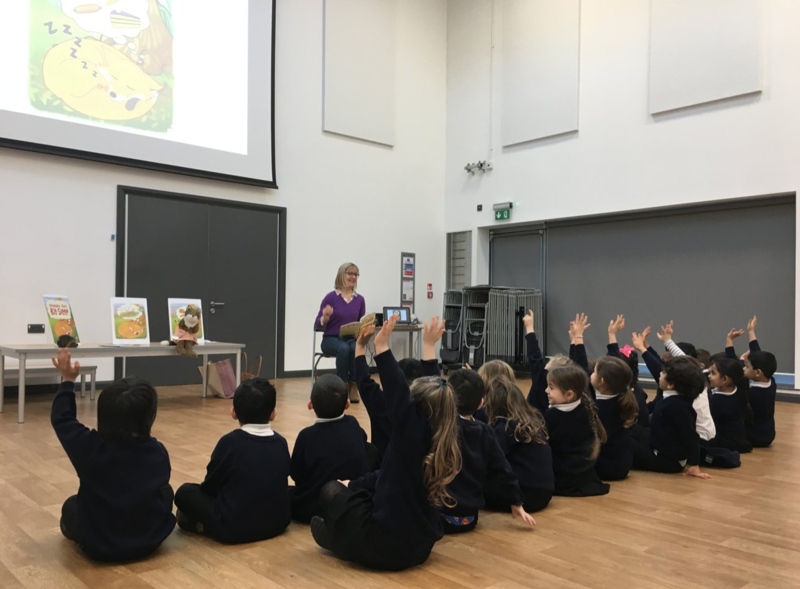 Oh – and if your child’s school would be interested in a school visit do check out my school visits page on my website ask them to get in touch. I also do Skype visits for schools abroad. London Book Fair – will you be there? I’ll be at London Book Fair again this year. I can hardly believe that it’s seven years since I attended the launch of The Alliance of Independent Authors (ALLi) there! Little did I know how much that would change my life. What a fantastic community of like-minded writers I have met since that time. If you’re going to be there do let me know and come and say hi. ALLi is running an event on the Thursday evening in conjunction with Amazon and that will be the place to be. That apart I’ll probably be there most days. You can find out more about ALLi here. That’s it for now and I hope that your children’s writing and/or publishing journey is going well. PS Remember, if you have How to Self-publish and Market a Children’s Book it would be great if you could leave an honest review online, however short if you’ve found it useful. With many thanks! This entry was posted in Blog Update, Marketing, Self-publishing, Writing & Editing and tagged foreign rights. Bookmark the permalink.